While many children form strong bonds with their brothers and sisters at an early age, an equal number of kids develop on-and-off rivalries with their siblings. These competitive relationships often begin before the arrival of a second child, as the older sibling may feel threatened or jealous about suddenly sharing his or her parents' attention. Of course, over time, sibling rivalries can evolve and intensify as brothers and sisters seek to distinguish themselves from each other. As a father, this enduring conflict may seem frustrating or unhealthy and place stress on you and your entire family. Don't fret – finding a solution to the fighting without taking sides or making the situation worse is a difficult, yet attainable goal. Here are some tips to bringing peace to your home. 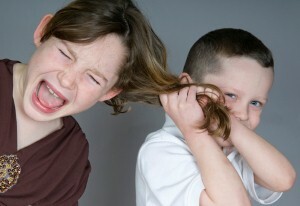 The first step toward dealing with sibling rivalries is to not get involved. Parents often feel the need to mitigate every minor family issue or conflict, but constant intervention can inadvertently make the situation worse by appearing to take sides. Likewise, your involvement in your children's problems can dismiss the argument for the sake of peace and quiet without allowing the issue to resolve itself – setting your kids up for another confrontation. Unless you sense the fight escalating to an unmanageable or violent level, keep your distance. If the rivalry becomes a consistent problem without resolution, your children may require you to act as a moderator to reach a peaceful conclusion. In order to achieve this, you must try to remain neutral at all times. Don't worry about assigning blame and be sure to treat each child as an individual, rather than labeling them as the "instigator" or "victim." This may cause additional resentment for children who feel slighted or isolated. Young children often need assistance from parents in understanding and vocalizing their opinions about a conflict rather than resorting to incoherent yelling. According to the University of Michigan Health System, you should allow your children to voice issues with each other. Let them express how they truly feel before you try to find a solution. By directing them to the root of the problem, you can help your children discover how to behave around each other on their own, instead of lecturing them.